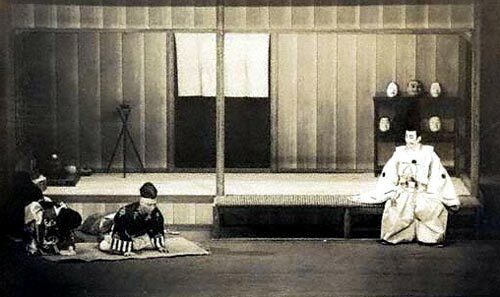 "Shuzenji Monogatari" was premiered in May 1911 at the Meijiza [casting]. "Shuzenji Monogatari" is made up of 1 act, divided into 3 scenes. Yashaô, a mask-carver of Shuzenji, has two daughters named Katsura and Kaede. Katsura is proud and dissatisfied with country life, yearning for service under a nobleman, while Kaede is gentle and satisfied with her simple life as the wife of her father's disciple Haruhiko. The Shôgun Yoriie arrives to inquire after a mask of his own face that he ordered some time ago. Yashaô apologizes profusely, explaining that he has started working on it time after time but that the result always lacked the fire of life, so he destroyed each attempt. However, Katsura brings out Yashaô's latest attempt, and Yoriie declares it a masterpiece. Despite Yashaô's protestations that it is not good enough, Katsura quickly hands it to Yoriie. Yoriie is attracted to Katsura's beauty and invites her to become his mistress. Katsura makes preparations to leave with him, all the while boasting of her conquest to Kaede and Haruhiko and taunting them about their rustic life. As soon as Yoriie and Katsura leave, Yashaô smashes all of his masks, announcing that he is finished because one inferior mask out in the world means his downfall as an artist. Yoriie lives in exile in Shuzenji, as he is Shôgun in name only, with the real power still in the hands of his mother Lady Masako and the Regent Yoshitoki. Kanakubo arrives from Kamakura with orders to assassinate Yoriie. Yoriie and Katsura try to escape with Haruhiko's help, but Kanakubo's men have already surrounded the area. When Haruhiko returns home, Yashaô and Kaede are relieved, but they are still concerned about Katsura's safety. A young warrior collapses at their gate, and when they bring him inside to care for his wounds, they discover that he is Katsura in disguise, wearing Yashaô's mask of Yoriie's face.